If you are an Oakland resident with a sincere interest in fire hazard mitigation, who does not believe the draft plan will reduce fire hazards, please attend one of these meetings. These are the issues we believe are being ignored and must be addressed by the City of Oakland. 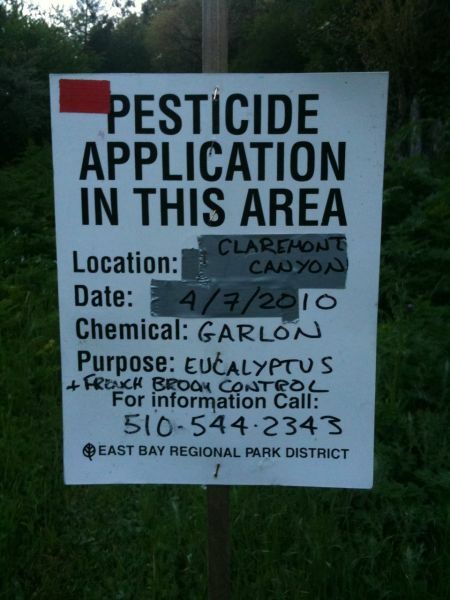 Pesticides are being used in the parks of the East Bay Regional Park District after completion of an Environmental Impact Report in 2009. The pesticide applications of the Park District are a preview of what will happen in Oakland city parks if the Vegetation Management Plan is approved as presently drafted. Pesticide use in Oakland city parks and open spaces is presently prohibited by Oakland’s city ordinance because no Environmental Impact Report has been completed for a revision of the ordinance that was proposed by the City Council in 2005. If the draft Vegetation Management Plan is approved and an Environmental Impact Report is completed as planned, pesticides will be permitted in Oakland’s parks, open spaces, and roadsides. Pesticide use will increase greatly because pesticides are required to prevent the tens of thousands of trees that the draft plan proposes to destroy from resprouting. Pesticides will also be needed to eradicate the flammable weeds that will colonize the unshaded ground. Native plant advocates are opposed to goat grazing because goats eat both native and non-native plants. Goat grazing is a non-toxic alternative to pesticides. Shade is the most benign method of weed control. Native plant “restorations” do not mitigate fire hazards because native vegetation is as flammable as non-native vegetation. When non-native trees are destroyed, as proposed by the plan, no native trees will be planted to replace them. Therefore, the moist forest will be replaced by grassland that ignites more easily than forests. Every wildfire we have witnessed in California in the past 20 years has occurred exclusively in native vegetation. Wildfires in California have become more frequent and more intense because of climate change. Deforestation is the second greatest cause of climate change because trees release the carbon they have stored throughout their lives, and in their absence carbon storage is reduced in the future. The native plant movement has a death grip on our public lands in the San Francisco Bay Area. Few would object to their advocacy if their projects were as constructive as they are destructive. They are welcome to plant whatever they want, but they should not have the right to destroy everything that is non-native, particularly using pesticides, which is their preferred method. I would like to believe that public policy is in our hands if we will participate in the political process. It is becoming more difficult to believe in that ideal. Please attend one of these meetings, if only to keep our democracy alive and well.